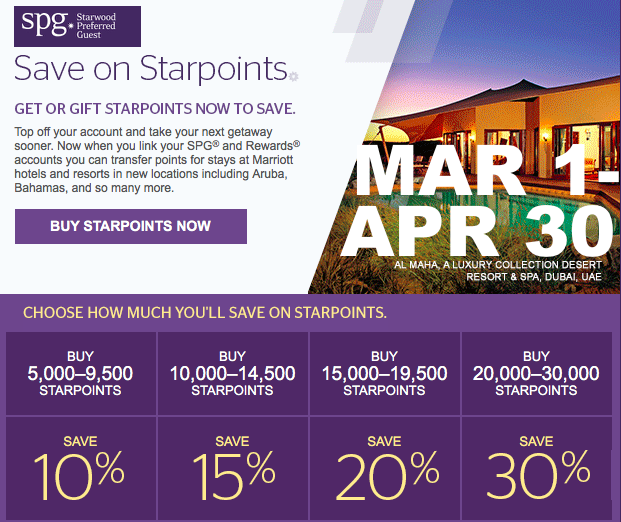 Starwood Preferred Guest (SPG) has launched a new Buy Points Bonus campaign for buying Starpoints at up to 30% off between March 1st – April 30th, 2017. You can purchase a maximum of 30,000 Starpoints per calendar year for your account or receive points as a gift. The account that receives Starpoints must have been open for a minimum of 14 days. The price of a Starpoint is 2.45 cents when purchasing the maximum amount of 30,000, however the 30% bonus already kicks in at 20,000 if you decide not to take advantage of the full amount. Does it make sense to purchase Starpoints at this price? Starwood has greatly devalued the Starpoints by the yearly category creep. There can be some values left during special events and high season if you decide to use the Starpoints for hotel nights. This is, however, a good way to purchase partner airline miles at reasonable price. You can convert 20,000 Starpoints to 25,000 airline miles in most partner programs (not on United and some others – see the table below – you can convert to United every now and then at beneficial rate by first moving the points to Marriott and then waiting for a transfer bonus promotion). When I purchased 30,000 late last year during the 50% off Mystery sale the Starpoints posted to my SPG account immediately which is always the case (compared to Marriott Rewards purchases which take several days to post). You can link your SPG and Marriott Rewards accounts and move points freely and in real time between them. 1 Starpoints = 3 Marriott Rewards point. Even if you don’t care about Starpoints, this is an opportunity to purchase Marriott Rewards points cheaply and later use them towards Travel Packages. I purchase the maximum number of Starpoints every single year during a good sale. While there were some better discounts last year like the mystery “Up to 50%” sale I would recommend to bit on this offer and take advantage of it now for multiple reasons. For one, this bonus is open to everyone and it’s not a mystery promotion (previously many Platinum accounts only got a 25% discount and members were upset about that). Another argument is that due to the upcoming merger of Starwood SPG and Marriott Rewards there is an expiration date on SPG and nobody knows how many sales are still left to take advantage of.